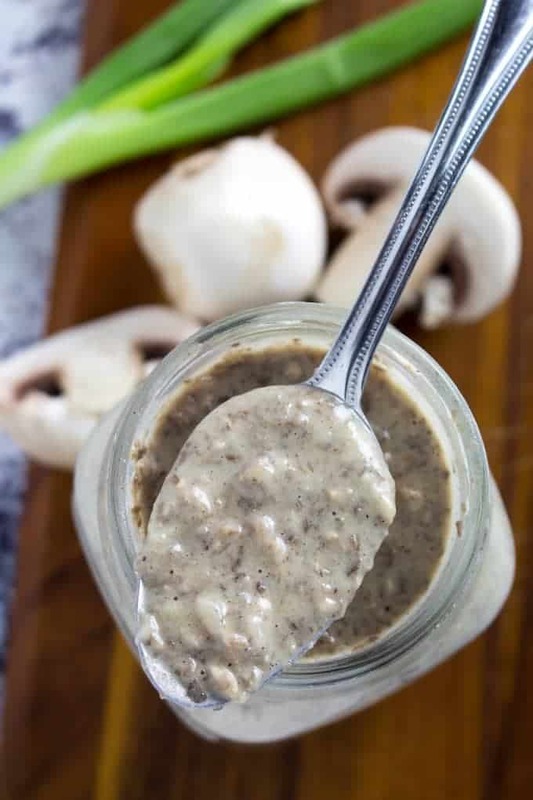 Gluten Free Cream of Mushroom Soup is a homemade version of the condensed can of soup you see in every casserole recipe. It’s super easy to make, and you can make a big batch and freeze it for when you need a quick ingredient for a recipe. You can also add some water and have it as just a bowl of soup! If you’re loving creamy soups, check out this Chicken and Wild Rice Soup, or Creamy Potato Leek Soup. 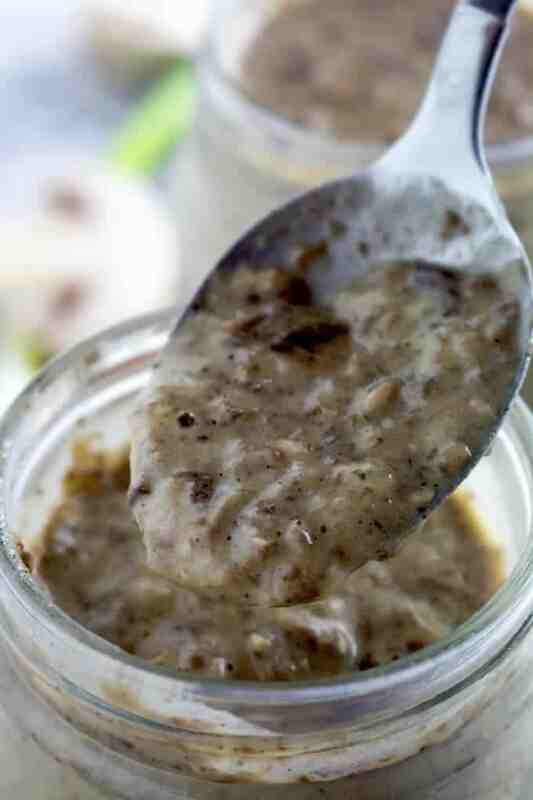 Gluten Free Cream of Mushroom Soup is a really quick and easy condensed soup recipe. I can’t tell you how many times I’ve looked up a recipe, only to find that it calls for a can of condensed cream of mushroom soup. And of course, that’s the main ingredient for the sauce in the recipe. Not to mention, it’s really hard to find it gluten free! That’s why I taught myself this condensed cream of mushroom soup recipe. Now I make a big batch of this, and freeze it in about 1-can sizes, so I can pull them out any time I have a casserole to make, or need a quick dinner. And I can rest assured that this is 100% gluten free, and much healthier! What does condensed soup mean? Condensed soup is basically regular soup, but with less water in it. It’s “condensed” down to just the main ingredients. That’s why you can add water to the soup and enjoy a regular bowl of cream of mushroom soup. That being said, this recipe is for the condensed version, so you’re going to want to add water before you eat it. Is there gluten free cream of mushroom soup? I have been lucky to find gluten free cream of mushroom soup in the store a time or two, but honestly it’s been really hard for me to find on a consistent basis. That’s why I find it so much easier to just make gluten free cream of mushroom soup myself. Can I substitute cream of celery for cream of mushroom? Both of these soups have the same texture, and they’re made in a really similar way. You can substitute one for the other, but keep in mind that one tastes like celery and the other like mushroom, so your final dish may be a little different in flavor. Also, make sure your soup is either certified gluten free or home made. How long does condensed cream of mushroom soup last in the refrigerator? 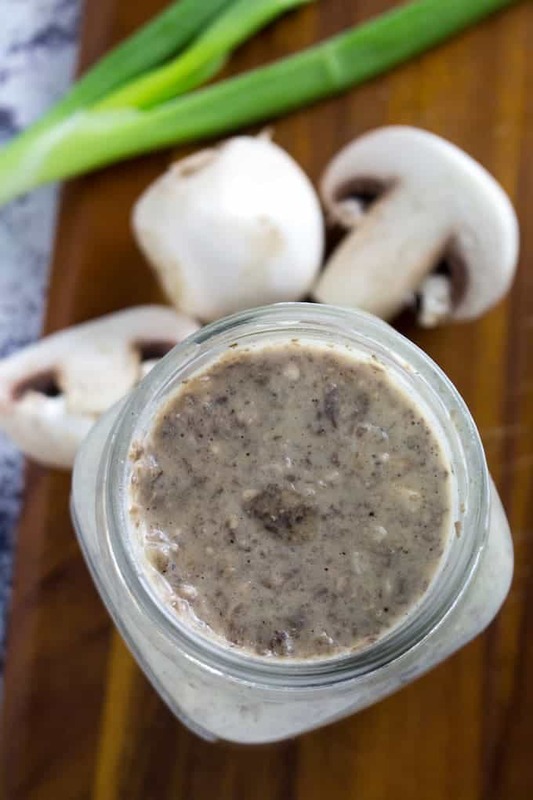 Tightly sealed, condensed cream of mushroom soup will last in your refrigerator for about 3-4 days. Unless I’m using it right away, I usually freeze it so I can make one big batch that lasts for a long time. Can you freeze condensed cream of mushroom soup? Yes, that’s one of the best parts about this recipe! You can freeze cream of mushroom soup by sealing it in an airtight container (like a plastic freezer ziplock bag). The key is to seal it tightly, if there’s too much air in there you’ll get frost. You can also freeze this in tightly wrapped ice cube trays, so you can use as little or as much as you want at a time. Keep it frozen for 5-6 months. How do you add cream to soup without curdling? For this recipe, I add the cream to the soup slowly while whisking. The idea is to introduce it to the heat gradually, instead of all at once. You can also pour a small amount of the soup into the cream while stirring, then add it all to the main pot. 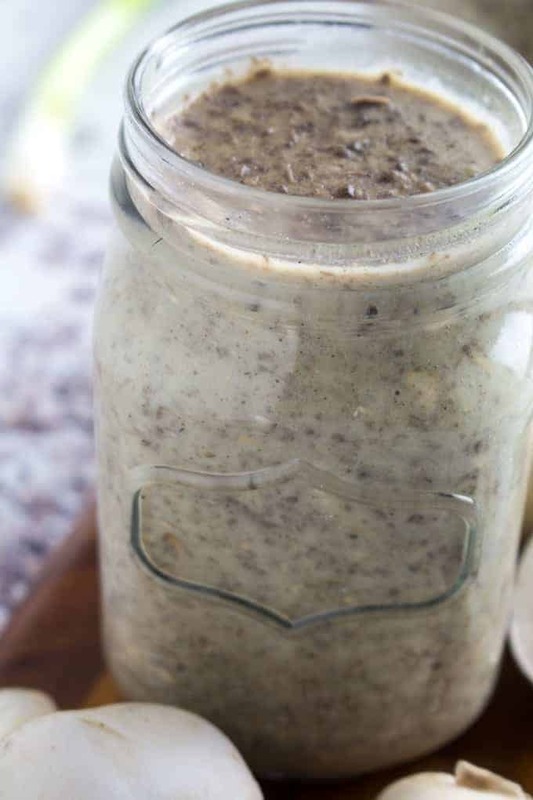 Gluten Free Cream of Mushroom Soup is a homemade version of the condensed can of soup you see in every casserole recipe. It's super easy to make, and you can make a big batch and freeze it for when you need a quick ingredient for a recipe. You can also add some water and have it as just a bowl of soup! In a medium saucepan sauté onion and mushrooms in butter over medium heat until browned. Stir in spices and broth. Separately, whisk together half & half and gluten free flour. Pour into the soup and stir. Once soup begins to thicken, remove from heat.